East Asia by the Powerhouse rotary was Steve’s to go for Chinese takeout for over a decade, but sadly they closed earlier this year and was replaced by Doowee & Rice. The menu is Asian based, but extremely limited – there is no pupu platter type food in sight. Amy and I got some takeout before settling in for a Sherlock marathon (If you haven’t seen BBC’s Sherlock, you are missing out!). We got crispy chicken hearts, sweet soy wings, pork belly bao, steak bao and chicken and rice. The chicken and rice is listed under their “Famous Rice Dishes” and does not live up to the hype. The chicken was dry, the rice was bland and the “great white” sauce was unappealing. The bao was better, especially the pork belly, a generous portion of 2 for $5. 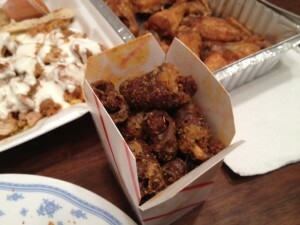 The wings were good, but not notable (9 for $6). The star of the meal was the chicken hearts – they were awesomely delicious and for $4, I can see myself stopping by for a small box as an afternoon snack. I was popping those suckers like it was popcorn.